Here you will find a selection of waterbed accessories and supplies to assist you in the care and maintenance of your waterbed. Because waterbed mattresses are made of vinyl, it is important that you occasionally treat the outside of the mattress to keep the vinyl supple and soft. It is also highly recommended that you treat your waterbed mattress with conditioner to prevent algae from forming on the inside of your mattress. You can also find other waterbed supplies and accessories on this page such as drain and fill kits, drain pumps, mattress pads and covers, safety liners and waterbed repair kits. Questions about accessories? Call us toll free at 1-800-630-5889 and we will help! Ultimate drain and fill system. 6-8oz bottles of Blue Magic waterbed conditioner plus 1 free patch kit. 2- 8 oz bottle of Blue Magic waterbed conditioner. 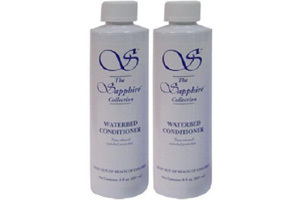 1-8oz waterbed conditioner and 1 patch kit. 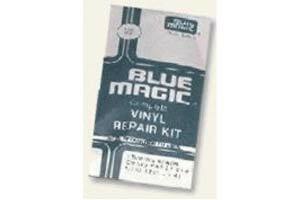 Fill and drain adaptors plus 2- 8oz blue magic conditioners. Stand Up safety liner for hardside bed. 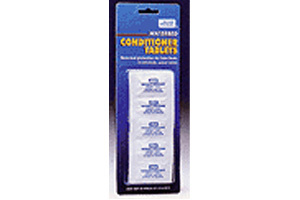 10 conditioner tablets (blue magic) for waterbed tubes. Pillowtop hardside pad which adds comfort to your waterbed. Ruby Ivory Quilted pillow top removeable hardside cover. electric drain pump-pumps waterbed completely dry in 45 minutes.